In Pursuit of My Own Library: What an overhaul! I cannot believe how much growth happened in just one book. I also cannot believe that it has only been two months since I had the opportunity to introduce the first book in the Dragonsworn trilogy. 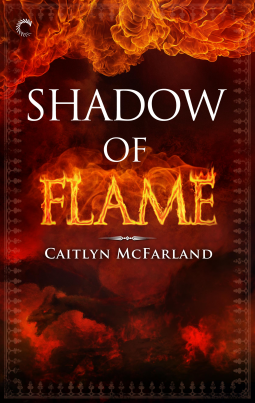 Where I was barely able to give Soul of Smoke 3 stars, I am happy to be able to rate Shadow of Flame with 4 stars. Caitlyn you have come a long way since 12th grade English, happy release day (again)! The angsty transition into adulthood tones down to a much more toreable level this time around without losing pacing and interest. We have the development of Rhys and Kai along with the pressures of life in a monarchy. There is intrigue as the gang tries to hunt down a spy. There is heart pumping action with skirmishes, treasure hunts, curses, and suppressed love. I can even say that a couple points of the plot managed to swing out of nowhere. McFarland makes statements towards the obvious suspects in order to throw the reader off the track which surprisingly worked. Truly impressed with the story development after the somewhat lackluster approach of the first novel. As I hoped with the first novel, dragons were a more obvious part of the story. With the war ramping up, the characters are spending more time in their dragon forms. And who doesn't love dragons? I am still certainly spoiled by Naomi Novik's in depth breed depiction, but I feel like we got to be a little more involved with each of McFarland's creations this time around. The mythology is developing into a fully fledged authorverse. Which brings me to my only came complaint with this novel. The intermixed Welsh is a neat touch (and part of that whole world building thing) but not really worth it to me as the language could sometimes interrupt the flow as I tried to sound it out in my head (spending more time with phoentics than enjoying the story--but I could just be weird like that). The rest of the plot and dialogue moved with a more resolved structure, though. I am very amazed at the amount of growth in the writing ability. The price is incredibly right on this release day too. I recommend you check it out.